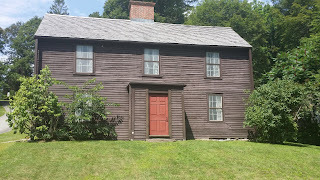 When I started this blog, almost two years ago, I wrote about a lot of my Salisbury/ Amesbury ancestors. Somehow I left out William Barnes and his wife Rachel. As I was writing my bio on the Copp family I realized that I was descended from William through not one but two of his daughters, Rachel and Sarah. His daughter Sarah married, for her second husband, John Harvey son of Martha Copp Harvey. Sarah's first husband was Thomas Rowell, the son of Valentine and Joanna Pinder Rowell, I am a descendant of Thomas' brother Philip. William has been very well researched and I have little to add other than putting my on spin on things, so here is what I know about William Barnes and his wife Rachel. The English origins of William Barnes and his wife are unknown. Their year of birth is estimated based on ages given during deposition in court. Rachel's maiden name is unknown. It is also unknown when they arrived in Massachusetts, either separately and unmarried or as an already married couple. William is believed to have been born around 1610 and Rachel in 1620. Today, Salisbury is a popular summer beach town. The puritan clergyman would probably have heart failure if he caught a glimpse of bikini clad gal on the beach. 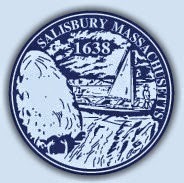 The Salisbury of 1638, the year it was founded, was an unrecognizable wilderness, requiring constant labor to produce food and shelter. There would be little time for building sand castles even if one was so inclined. William Barnes arrived by 1640, he and Rachel began the arduous task of clearing land and building a home for their children. Although the town was formed in 1638 no land division occurred until 1640. On a list of the first 70 odd settlers William was number 29. William was allocated land in both the 1640 and 1643 divisions. William was a house carpenter by trade and since there were no houses at the time he should have had plenty of business. The first houses would have been built of logs as the first sawmill would not be established for some years. In the early days of the Massachusetts Bay Colony the towns were small, communities might start with fewer than 100 families. Men not only worked to farm and provide for their families but also had to work for their town. Most towns had quarterly meetings and the local court meet quarterly as well. 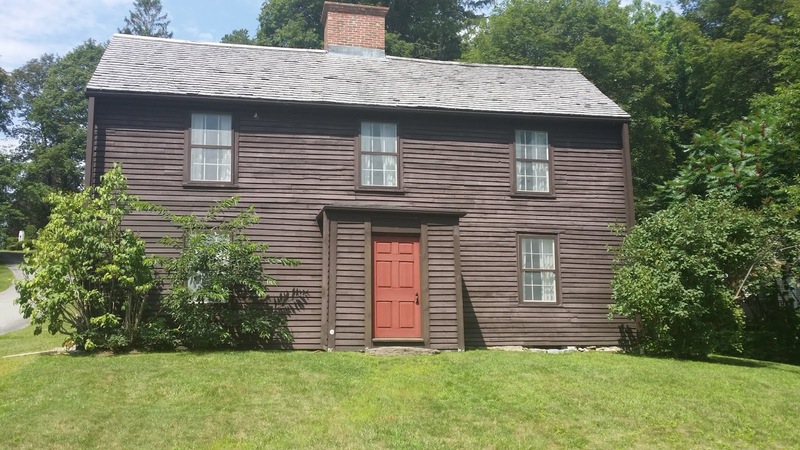 Men were required to serve as selectmen, jurist, constable, Justice of the Peace, lot layers, line layers between towns, and a dozen other jobs. Men could be elected to a job over their objections. William was elected constable after the first two men chosen refused to do the job, they were fined, of course. In 1642 the good people of Massachusetts took time out of their busy lives to argue about the baptism of babies. William having been made a Freeman of the Colony the previous year was obviously an upstanding member of his church but he found himself on the wrong side of approved doctrine when he and his wife were presented in court for saying that child baptism was not ordained by God. William and Rachel were not alone in this belief and many of their neighbors were also in court and were admonished for their personal religious beliefs. The Puritans may have come crossed an ocean for religious freedom, but you were free to practice only the proscribed theology of the ruling clergy. Correct me if I'm wrong but this argument against infant baptism is a tenant of the Baptist religion. Were William and Rachel leaning towards Baptism beliefs? Not terribly long after the settlement of Salisbury, men began farming and eventually moving inland from the coast and across the Powwow River. The inhabitants of this 'new town' signed articles of agreement with members of the 'old town' and set themselves apart as an independent town which they called Amesbury. William, by now aged around 45 was one of the Salisbury men who made the move. He played a prominent role in local government, serving on juries and filling other town positions. It may seem funny today, but a man knew where he stood in his community by the bench he sat on on Sunday at the meeting house. Meeting House seating was assigned by a committee, of men of course, and the closer you were placed to the front the higher your social standing. Men sat on one side, women on the other. In 1667 William and Rachel were assigned very prominent seats reflecting their high social standing. In 1652 William became partner and co-owner of a sawmill. The other owners were Philip Challis, William Osgood, Anthony Colby and Samuel Worcester. Building a sawmill was an expensive business which was usually shared by multiple partners. The sawmill was profitable for all the men involved but also was a source of contention. William Barnes and his partners were in court several time in lawsuits concerning the mill. William and Rachel had eight children, two boys and six girls. Neither boy lived to adulthood but all six girls married and raised families. Because their brothers died young, the girls and their children inherited their father's estate. I can't help but think that the lack of boys was a great disappointment to William or any man in such a male dominated society. William must have had a hearty constitution. He died on 14 March 1697/8. Rachel had died on 9 Feb 1685/6. 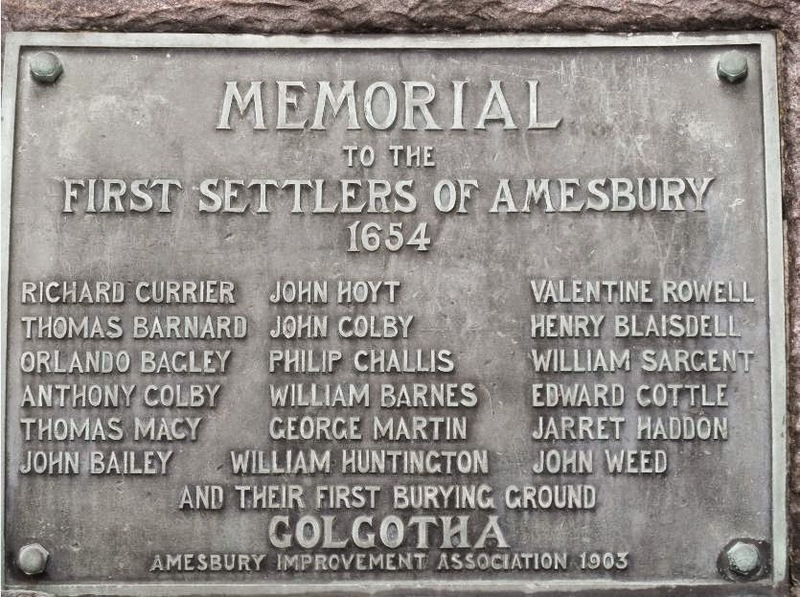 They were most likely buried in the Golgatha burial ground, they first cemetery in Amesbury. His estate was valued at 516 pounds. Not to shabby. Hoyt, David Webster. The Old Families of Salisbury and Amesbury, Massachusetts: With Some Related Families of Newbury, Haverhill, Ipswich, and Hampton, and of York County, Maine. Baltimore: Genealogical Pub., 1982. Print. Threlfall, John Brooks. 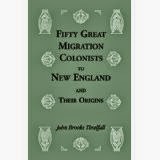 Fifty Great Migration Colonists to New England & Their Origins. Bowie, MD. : Heritage, 1992. Print.